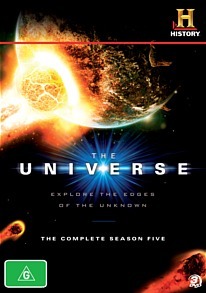 The Universe the Complete Season 5 DVD Review The Universe won’t appeal to people who pore over scientific journals in their spare time. In season 5 of The Universe, we get a look at some features of our solar system: Some well known, like Jupiter’s great red spot, some less familiar (but none the less impressive) such as geysers spouting from the icy moon Enceladus. Each of the eight episodes tackles a different subject. Some of them deal with specific research, such as NASA’s new push to find liquid water on Mars, while others are speculative doomsday predictions. Want to know when the sun will finally burn out, what phases it will go through and whether or not it will become a supernova? You’ll find out here. Want to know the ramifications for life on Earth, should our planet’s magnetic field flip over? That’s covered as well. The Universe is very much a show that is designed to appeal to the layman, rather than space boffins and scientists. Shots in deep space, as we zoom around comets and asteroids, are often accompanied by dramatic whooshes-sounds that wouldn’t be heard in a vacuum. This is forgivable, as are the workmanlike CGI effects for planets and probes. What made me cringe were some of the analogies used to explain the physics. The concepts described are compared to everyday things, such as a football game or a car running out of gas. Some of these make sense, but when you try to compare a space probe sling-shotting around Jupiter to a man hitting a baseball, the analogy becomes strained. Watching ‘The Universe’ on DVD requires a bit of patience, for the fact that a lot of recapping occurs after the pauses that would be occupied by ad-breaks on TV. You’re also very aware that this is a documentary on a budget, because a large number of shots are re-used from earlier episodes. If you can get past the shaky presentation and the awkward analogies, there’s actually quite a lot of factual information to be found here. A small group of scientists provide opinions and detailed information throughout each episode, giving the show its authenticity. New ideas on the search for extraterrestrial life are presented, giving you the most up-to-date scientific views from the time the show went to air. The Universe won’t appeal to people who pore over scientific journals in their spare time. It’s meant for the average Joe, the amateur astronomer who wants to keep him or herself in the loop about the ongoing exploration of space.